Ultra violet glass bottles, as opposed to the conventional glass bottles, offer a lot more advantages. Ultra violet glass bottles help in extending the freshness and potency of stored materials, contrasting to the conventional glass bottles which just store contents. Conventional glass bottles provide improper protection against visible light as compared to the ultra violet glass bottles which can extend the freshness of the stored material by blocking out the harmful spectrum of visible light responsible for degradation and decomposition while selectively allowing infrared and UV-A rays. These bottles can preserve goods ranging from six months to two years. Ultra violet glass bottles are airtight, thus locking-in the freshness & fragrance inside them. In addition to that, ultra violet glass bottles are eco-friendly. Ultra violet glass bottles are fairly durable as they are made of special pigmented glass which is thicker than conventional glass bottles. They can easily survive most everyday carpet falls. Moreover, such bottles look aesthetically beautiful and premium, making them a great proposition for cosmetic and food companies. Compared to other packaging formats made of plastic, ultra violet glass bottles do not contain additives/chemicals that might influence the hardness, or the texture of material stored. Ultra violet glass bottles are offered in various sizes and bundle packs by vendors. These bottles are mostly used for cosmetics and medicine end-use. The title “Ultra Violet Glass Bottles Market” has been chosen owing to the increasing uptake in the adoption of such bottles. More and more companies are adopting ultra violet glass bottles packaging format as regulatory bodies worldwide are offering discouraging environment for plastic packaging. In addition to that, the ultra violet glass bottles market is expected to present multi-million dollar incremental opportunity during the forecast period. For the ultra violet glass bottles market study, various parameters of demand and supply side have been taken into account. Among the major factors, the parent market of glass packaging has been studied. Import-Export data for the same has been analyzed to arrive at the market size. Moreover, individual companies and major market players in the ultra violet glass bottles market are also tracked to triangulate the market size. The competition and innovations in the ultra violet glass bottles market have also been taken into account in addition to the investments made in the ultra violet glass bottles market. 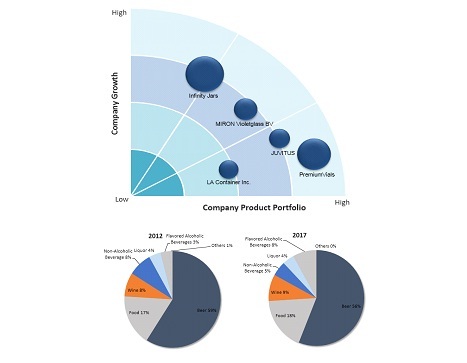 The competition arc below represents some of the major companies operating in the ultra violet glass bottles market. The various market players are studied and plotted against their growth (Y-o-Y) and their offerings. 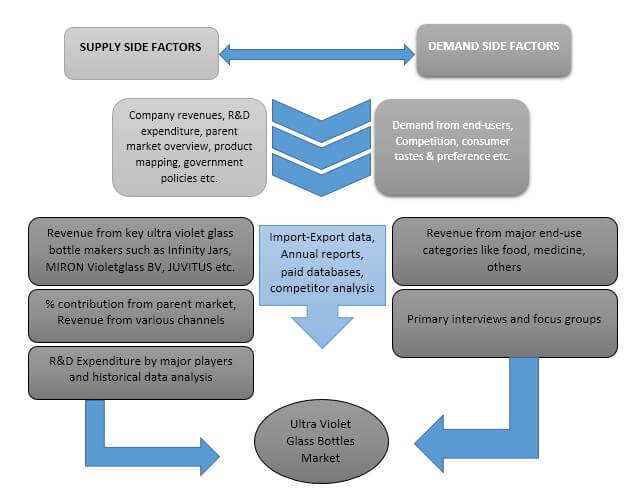 The points they are plotted at signifies the company’s relative position in the ultra violet glass bottles market. The size of bubble indicates the company’s revenue.